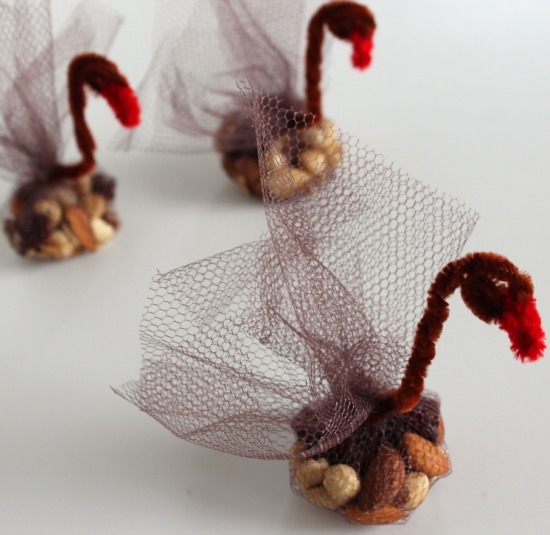 We’ve made these turkey favors before, even with an updated look, but this year, we’re trying to go on the healthier side with what we offer inside. So I’ve added a nuts, seeds, and berries mix to our cute little turkeys for the Thanksgiving table. 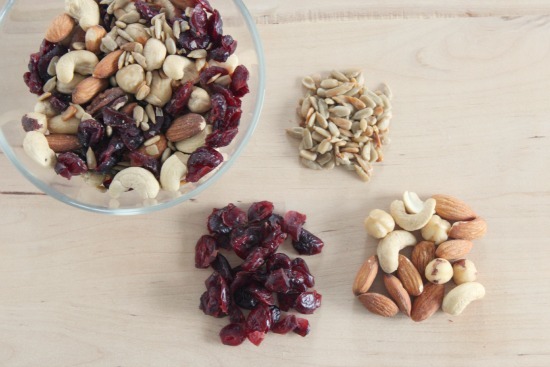 *You can really add almost anything to these little guys. Even a small gift could fit inside, maybe after-dinner mints, or even craft stuffing to make it a toy for the kids. Have fun mixing it up. 1. 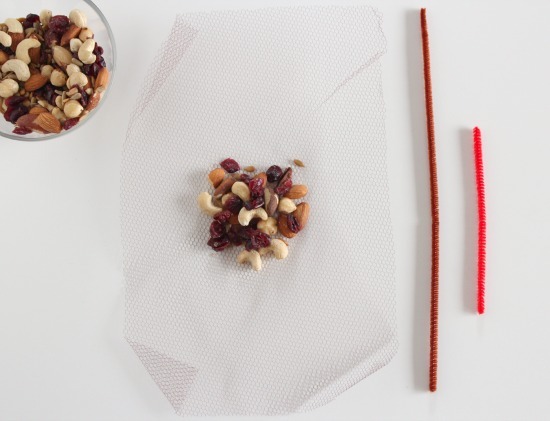 Lay out your tulle and add a small handful of the nut mix. Just enough to make it a good size turkey body. 2. 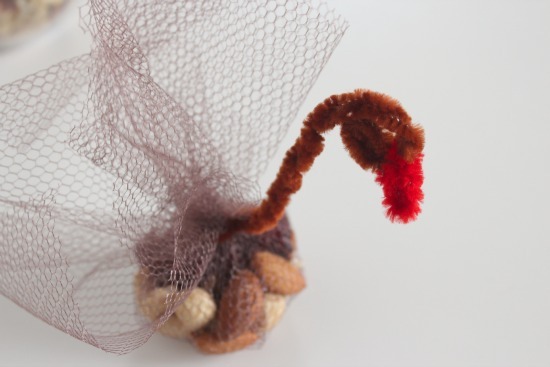 Wrap your pipe cleaner around the tulle to tie in the nut mix and twist. 3. Continue to twist the pipe cleaner together all the way up. 4. Curl your pipe cleaner down from the end to form the turkey’s head. You can bend it a little at the bottom to create the curved turkey neck. 5. Thread your small piece of red pipe cleaner through the hole of the turkey’s head and twist. This forms it’s fun “waddle”. 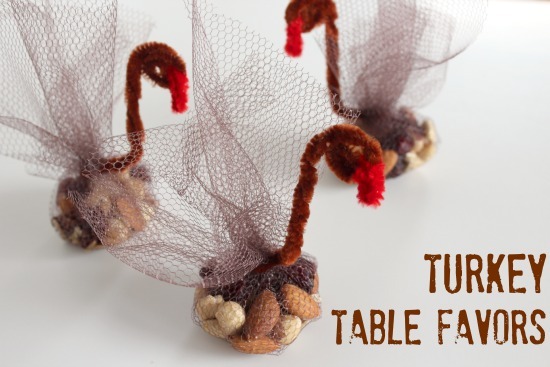 You’re ready to gift your guests with a fun turkey treat! Wow! And if you use PINK tulle & pipecleaners and dark for the bill, you’ve got summer party FLAMINGOS!!! Jen!! I LOVE that idea! Yes, perfect for flamingos. I might have to style a party just so I can make those!! These are so cute and look easy to make. I’m going to get teh stuff and have my daughter make these. Thanks!